Port Morris Station will be a terminal for the NYC trunk‐line located along the Northeast Corridor in Port Morris, The Bronx. The station will be a regional mass transit hub for the New York State and Connecticut landmass. The complex will offer free transfers between Amtrak long‐distance rail, commuter rail, the NYC Subway, local and regional bus routes, as well as LaGuardia Airport. Additionally, Port Morris Station will feature a park‐and‐ride facility, making it one of the most connected transit hubs in country. Port Morris is the best location for the end of the NYC trunk line because it is at this location that the Metro‐North Harlem & Hudson Lines can be linked into the Northeast Corridor. Constructing the new connection will only require reactivating an abandoned right‐of‐way and constructing two new tunnels. NYC‐bound Metro‐North service will terminate at Secaucus and Grand Central Station, creating a more resilient and robust transportation system. Constructing a new station and rail yard at Port Morris is necessary because the existing rail yard at Sunnyside, Queens is at capacity and is not able to be expanded. 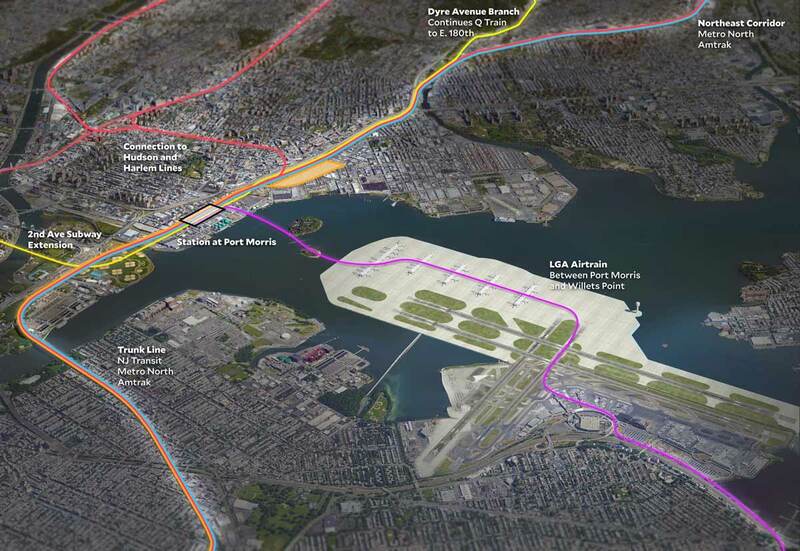 As a major regional transportation hub, Port Morris Station will have the unique advantage of potentially transforming LaGuardia, New York City’s least accessible airport, into one of the most accessible airports in the United States. Such a transformation will be as easy as constructing an airtrain shuttle from Port Morris Station, under the East River, and into the existing LaGuardia Airport or an expanded LaGuardia, as proposed by ReThinkNYC. Currently, Port Morris is zoned primarily for industrial and light manufacturing. However, with its proximity to Manhattan, the Bruckner Expressway, and the long underdeveloped waterfront along the East River, the area offers a unique opportunity for multi‐use development to serve both Bronx residents and commuters who will have access along the Trunkline.